EU projects are places of learning. We can make the competence development visible. The development and implementation of learning offers may be the core aim of an EU funded project. But even if other project aims are pursued, learning also happens incidentally in any kind of project. Actors in EU projects develop key competences like, e.g., communication, team work, or intercultural management while implementing the project. 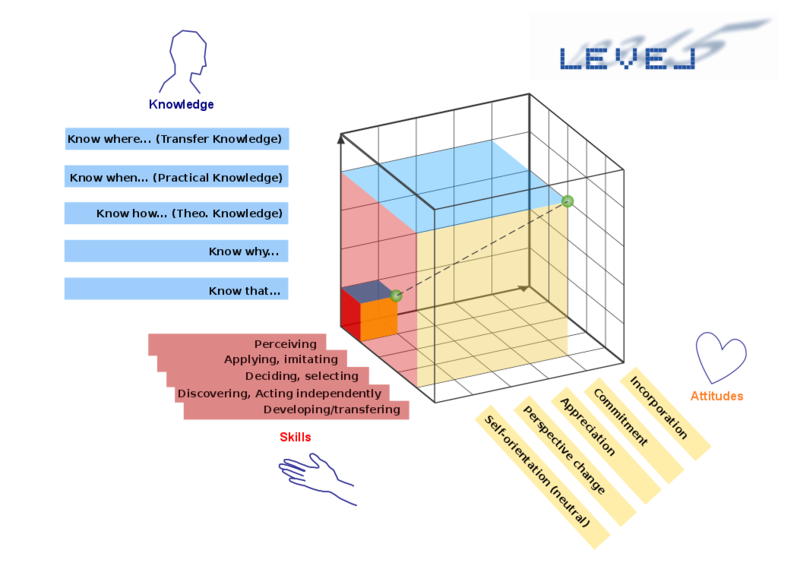 For years we have been cooperating with the REVEAL network, which has developed and in more than 150 learning projects successfully implemented a comprehensive, software-assisted approach at validating informal competence development called Level5. Through a special software, the results can be presented in a three-dimensional cube. This visual documentation, accompanied by an explanatory description, makes it possible for the individual staff member or client , to become aware of their own achievements, as well as to demonstrate and communicate informally acquired competences to employers or anybody else concerned. Moreover, institutions carrying out EU projects may find the approach very useful to document a project’s impact on the stakeholders involved. Please get in touch with us Link to contact page to discuss how the approach may create added value to your project. We can provide training or consultancy how to use LEVEL 5. We can also be your partner who or tailors LEVEL5 to your needs and applies the system in your project.